Until recently, almost no one cared for Johannes Gutenberg, who centuries ago invented letterpress printing and revolutionised the distribution of the written word. Thanks however, to The Distillery, it’s making an almighty comeback. 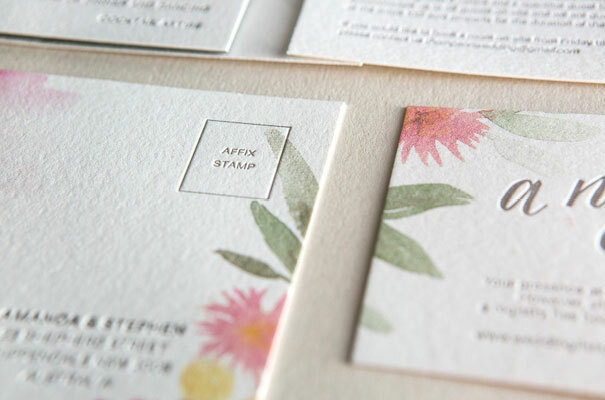 From their industrial style studio in Sydney, this team of creatives work tirelessly to create unique, custom designed letterpress stationery for all kinds of occasions – including, most importantly, weddings! Their new collection, titled Summerscapes boasts five gorgeous wedding stationery suites including the Blossom suite featured here. Lush and sophisticated, this invitation pairs soft watercolour florals with glistening gold lettering – a polished design perfectly suited to a cheerful and heartfelt wedding day. To see what else is on offer (like the Peninsula suite or Marrakesh suite) click here. Of course they still provide a fully personalised service if you’d prefer to run with your own creative concept. Just simply drop them a line! CREDITS Letterpress stationery The Distillery.